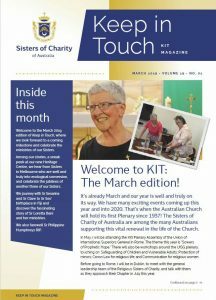 Four times a year, the Sisters of Charity of Australia publish Keep In Touch (KIT), the magazine which lets the families, friends, and connections of the Sisters know what is happening within the ministries of the Congregation. It is here, too, that we mark the significant jubilees of our Sisters, and also the tributes for the Sisters who have died. If you would like to be included in KIT magazine email out, please email James Griffiths at the Congregation office and he will add you to the distribution list. You will find back issues of KIT to December 2013 in the menu on the right hand side of the page, with indications of some of their content.